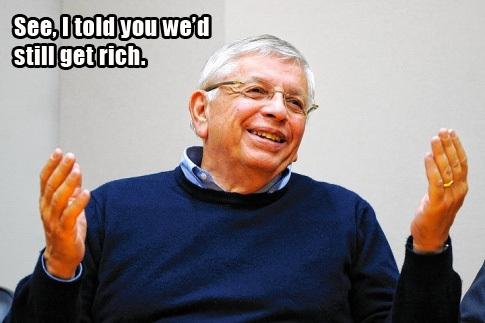 In a season that began with a tug-of-war between owners and players over which party will have the privilege to pocket the majority of cash coughed up by a nation of fools, the 2011-2012 basketball campaign saw NBA Commissioner David Stern’s continue his masterful racketeering scheme more efficiently than ever. How he and the league attract anybody to watch regular season basketball after this public display of greed-laden grievance, let alone shell out $40 for a cheap seat, is perhaps the shrewdest scheme in the entire world of sports. The inability for both sides to reach an agreement in a timely manner led me to declare a personal boycott on NBA basketball for this year’s games. As it is, I spend enough time and money feeding my appetite for spectator sports without basketball. If these multimillionaires feel the need to fight over my money without providing any notable service in return, I will happily watch other millionaires play a children’s game with a different-sized ball on TV while wearing a shirt that matches theirs. I can also fill the void of witnessing the nightly tattoo exhibition by attending a heavy metal concert or shopping at my neighborhood Safeway in Northeast Washington, D.C. I knew I smelt a rat the moment Stern nixed the trade that would have sent my dearly beloved Chris Paul to my favorite team, the Los Angeles Lakers, in a naked act of corporate fascism by virtue of the league’s role as puppeteer of a fledgling New Orleans Hornets franchise. This feeling surfaced again when New Orleans “won” the NBA lottery for first overall pick in the 2012 draft, just in time to announce—or is the correct term “reward”—George Benson’s new ownership. Whatever it was, it was only transparent in that it was clearly a conflict of interest, in which case, eroded any shred of faith or interest in the ethical aspects of the game. Instead of having a player on the Lakers that I could unabashedly support to the cusp of frightening levels of fanboy-ism, I was abandoned at the altar. Instead, I was left to cheer for a team that features a brain-dead clown named Metta World Peace, the tallest 12-year old boy in human history, a Spaniard with a disappearing olé move that is the envy of his bullfighting countrymen, and some mega-superstar who is likely the most unpopular guy in his own locker room. That was the moment I preemptively flushed the toilet on the 2012 NBA season. Since Christmas of 2011, fans have been treated to an expedited sprint in a full-on crawl through the most meaningless regular season of all time, culminating in the biggest charade of all—the 2012 NBA Finals. Is anybody surprised that the Miami Heat are in the Finals? I could have laid money down in Vegas during the lockout with peace of mind knowing that when I won, I would at least receive even money in return. If there were any doubts beyond that point in time, they were laid asunder the precise moment Derrick Rose tore his ACL in Round 1 of the Playoffs—or when referee Joey Crawford was spotted at the Caesar’s Palace Sports Book on New Year’s Eve with Dwayne Wade and Udonis Haslem, placing a fat sack of cash down on “Miami Heat World Champions 2012” at 3:1 odds. Did anybody ever doubt that the Oklahoma City Thunder would stake their claim atop the Western Conference this year? As a Lakers fan, there was never a doubt in my mind. Is there any reason to watch the regular season or the first two rounds of the NBA Playoffs anymore? I always applaud the cynic’s approach in life, especially when you don’t have a horse in the race. Even though we are presented with another opportunity to cheer for the Larry O’Brien trophy to slip through LeBron James’ ham-fists during the most crucial point in the season yet again, I am not sure that is enough anymore. However, this could change should it occur in an epic Game 7 meltdown, similar to Kobe Bryant’s bed-messing against Boston in 2010, except that LeBron isn’t bailed out by his teammates and is left to bear the brunt of failure throughout another offseason—an offseason of failure manifest in cashing monthly $10 million checks and horghing it up in South Beach. Come on, rivalries aren’t born naturally. They are concocted by NBA marketing executives who calculate the maximum amount of revenue generated from advertising during telecasts, cramming as many Taco Bell Doritos Locos Tacos and Nike commercials into a 48-minute long contest spread across four hours of prime-time television. The only thing holding back the league’s wet dreams of trillion-dollar paydays is the utter ineptitude of the New York Knicks franchise, keeping the nation’s largest television-viewing market watching Jersey Shore and the Real Housewives of New Jersey during the NBA Finals broadcasts. 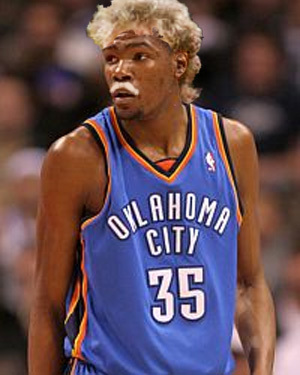 Kevin Durant is probably my favorite player to watch among the current crop of NBA players. In fact, he’s one of the few players in the past 20 years to really draw me into watching the game because of a single player. He seems like the kind of guy that loves playing the game, even in his spare time. And, he’s really freaking good. This also parallels point #1 about cheering against LeBron James, so this may actually factor into me watching some of this pageantry. Series Outcome: Heat in 7. Mo’ money, mo’ money, mo’ money. This entry was posted in Sports and tagged basketball, David Stern, Finals, Kevin Durant, LeBron James, NBA by Troy Beckman. Bookmark the permalink. It always feels as if the NBA post-season is at least as long as the regular season was. This year with the lockout/strike…it really almost amounted to the same amount of time. Stephen A. Smith’s increased presence on ESPN/ABC will be enough to drive many prospective viewers away. Ahh, Stephen A. Smith. Just glad that we don’t have to hear him and Skip Bayless jibber-jabber at each other during prime time.